Georg Heygster, head of the Physical Analysis of Remote Sensing Images unit at the University of Bremen’s Institute of Environmental Physics, announces a new record Arctic ice minimum today. Arctic ice cover plays a critical role in regulating Earth’s climate by reflecting sunlight and keeping the polar region cool. QUESTION: At the last minimum, in 2007, how much did global temperature rise due to the reduced ice cover? ANSWER: Global temps did not rise in 2007 — they fell about 0.4°C. Any albedo effect reducing global temperatures is likely to be insignificant. Retreating summer sea ice [is] 50 percent smaller in area than four decades ago. From The Cryosphere Today, I make it about 30% smaller. The NSIDC agrees (“Arctic sea ice has declined more than 30 percent in summer since satellite measurements started in 1979”). In any case, what significance does the summer minimum have, when the extent of winter sea ice is only about 6% reduced over 40 years ago? It recovers well from the (perfectly normal!) summer minima. It is also further evidence of a strong human imprint on climate patterns in recent decades. Keep that funding rolling in, folks. But Georg, how can this be? What evidence ties the reduction in sea ice to human activities? Did you know it’s been reported that the reduction in sea ice is linked strongly with winds and ocean currents moving warm water into the polar region and shifting floating ice out? That it’s nothing to do with warmer air temperatures? The melt season for Arctic sea ice will soon draw to a close. Surface melt has already largely ended and the ocean waters are cooling. Air temperatures at the North Pole have fallen below freezing. However, with the ice cover now thinner than in years past, there is a greater potential for late-season ice loss, caused by warm water melting ice from below or winds that push the ice together. Whether Arctic sea ice breaks a new record hinges on three factors: First, how much heat is left in the ocean to eat away at the ice edge and bottom? Second, will wind patterns blow the ice together and reduce ice extent or will they disperse the ice and expand ice extent? Finally, just how thin is the remaining ice cover? Thin ice quickly melts away when it is surrounded by warm water. Sea ice melting has little to do with warm air and everything to do with (relatively) warm water. Which is not heated by our activities, since the air cannot heat the water beneath it. Try blowing on cold water, see if it warms up. Still, if you say so, Georg… No, on second thoughts, I’m wrong to trust you without evidence, since you are a climate scientist and we haven’t checked your emails. So, please refer us to the evidence that leads you to your conclusion. Climate models show, rather, that the reduction is related to the man-made global warming which, due to the albedo effect, is particularly pronounced in the Arctic. Climate models show this? Models which are programmed by humans with low understanding of the climate systems? Or models which are programmed from the laws of physics? We know models based on physics just don’t exist, and models programmed by us are entirely unskilful. To quote model results to us shows how ignorant you think we are. And, having done that, now we know just how ignorant you are, Georg. Stop pretending and stop trying to alarm us. Instead, adopt scientific practices. Temperatures in the Arctic region have risen more than twice as fast as the global average over the last half century. Jones 1880-2004 Arctic 70N to 90N. So, before Arctic temperatures soared from 1960 to 2000, they soared further and faster from 1915 and dropped again. So why does it matter if they do it again and how can it suddenly be our fault? Climate scientists should begin to take we sceptical listeners seriously. The more they misinform us, the more often they repeat fallacies, falsities and flat-out fibs, the more resentment they create in their formerly trusting public, the more anger they arouse and the swifter and more violently they will be removed from their positions of influence. Tell the truth, gentlemen, and follow proper scientific procedures, because it will all come home to roost. Good or bad, your own actions will judge you. As sea ice is 90% submerged, its growth and extent is entirely driven by seawater temperatures. No objective scientist would claim that the extent of Arctic sea ice tells us anything useful about air temperatures. If the world’s sea ice is diminished, does that support the view that ocean heat is increasing (as a result of imbalance in the global heat budget)? Well, that might be a useful working hypothesis. BUT the establishment never tells us the extent of global sea ice – we only hear about the Arctic. Antarctic sea ice has increased by 30% over the past 30 years. Just marginally, GLOBAL sea ice acreage has also increased. So,the working hypothesis should be that ocean heat content has decreased in recent times. Well said! Can’t see any death spiral here. 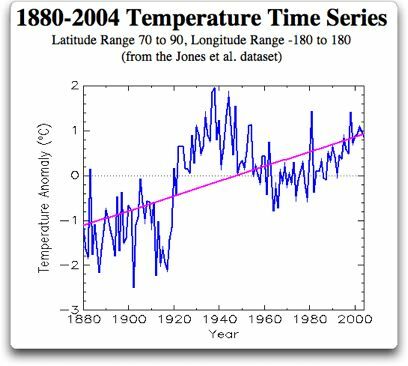 How can someone look at this graph and still say that the conditions today are unique? Only if you decide to say that CO2 back in 1880 had bizarre power that it doesn’t have now. But wait! CO2 is only supposed to show up after 1965, so …. Cognitive dissonance. Witchcraft and bad weather. Al Gore and cold snaps .. Wait again. The Gore/cold is true. So the witch/warlock is Gore? It’s not really about the ocean temperature changing, so no graph of that will assist the story. There’s always warm water about, and if the currents take it under the ice, it’s going to melt. What “other falsehoods” would you like to point out?